Just as I was mid-mouthful into a hot steaming bowl of ba chor mee last night at Bras Basah with a couple of friends, my phone started buzzing off its rocker. It went on with such urgency that I had to halt my inhalation of said noodles (not enough vinegar, but chilli was quite fragrant and thus shiok) and look at what's happening. 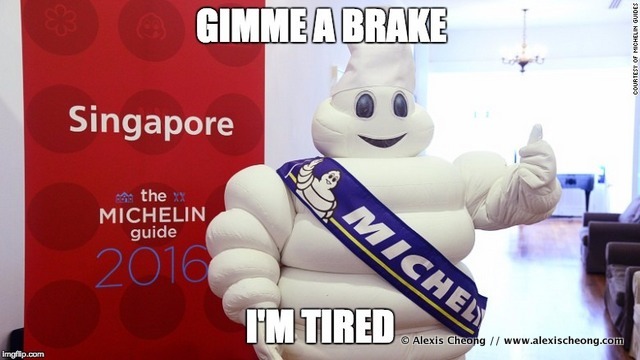 "Live streaming the Michelin star results now on Facebook," said my youngest brother. "Who won?" asked my sister who resides in Macau. My brother rattled off the 1-stars as they were announced. "Alexis why no there?" My sister asked. I looked down at my bowl of noodles. That is my Michelin star right there. "Andre and Odette 2 stars," my brother updated. "That's it?? If they are not top then who else?" my sister asked. 3 is normally the best and we pondered on whether there are any in Singapore. "HOLDDDD YOUR PETS", my brother said a while later. "They are announcing the 3-stars." The only 3-star restaurant in Singapore was announced. It probably came as a shock to everyone who wasn't already privy to the news. And we all know what happened. 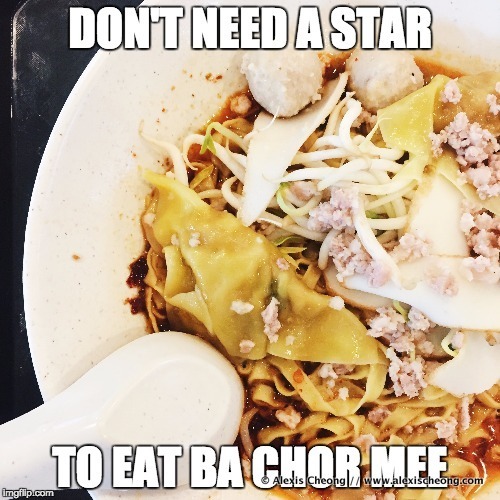 Despite all that though, I have faith in Singaporeans that they will let their tastebuds judge for themselves, star or no star. While Michelin has made its mark in the world to become the most famous good guide, this year's results here has shown how off it can be when it comes to our food. While some restaurants genuinely deserve the accolade, the questionable choices had thrown the entire guide off-kilter and thus destroyed its credibility. And perhaps that is a good thing, because we will continue to queue for the stalls and restaurants that we judge for ourselves to be worth it. We don't need another guide to tell us what we already know to be delicious. Especially when the guide comes from a tire company that wanted people to drive more to restaurants to eat so they can sell more tires. There, I said it. Want to know where to go for your next meal? Ask a friend lah!